With the first models rolling off the Marysville, Ohio assembly line today, the all-new 2014 Accord Hybrid (http://automobiles.honda.com/accord-hybrid/) will carry an EPA fuel economy1 rating of 50 mpg in city driving, making it the new leader in gasoline fuel-economy ratings among 4-door sedans. Set to go on sale at Honda dealerships nationwide later this year, the 2014 Accord Hybrid's city fuel-economy rating is three miles per gallon higher than the closest segment competitor and its calculated driving range of 673 miles is more than 46 miles3 farther than any vehicle in its segment. "Even before it hits showrooms this fall, the Accord Hybrid is already surpassing the competition and claiming segment leadership," said Mike Accavitti, senior vice president of auto operations at American Honda. 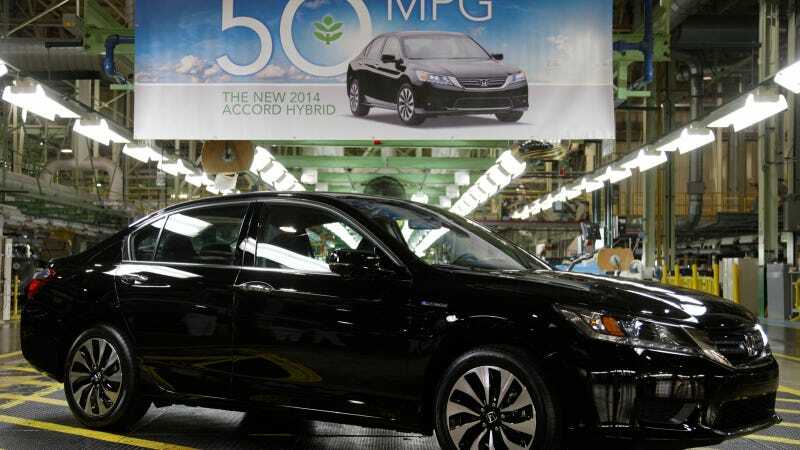 "For customers looking for a 50 mpg rated 4-door sedan, there is no other choice than the 2014 Accord Hybrid." With EPA fuel-economy ratings1 of 50 mpg city / 45 mpg highway / 47 mpg combined, the 2014 Accord Hybrid combines the sophisticated exterior styling and spacious interior packaging of the Accord Sedan with a highly efficient two-motor hybrid system from Honda's Earth Dreams™ Technology advanced powertrain series. The Accord Hybrid joins an already fuel-efficient Accord lineup that includes the EPA-rated 36 mpg highway1 4-cylinder Accord Sedan and the Accord Plug-in Hybrid, EPA-rated at 115 MPGe combined1 in electric-only mode. The 2014 Honda Accord Hybrid is the first Honda hybrid vehicle produced in Ohio, at the company's Marysville Auto Plant, and joins the Greensburg, Indiana-built Civic Hybrid as the second Honda hybrid model built in the U.S. Honda invested $18.8 million in a 94,000-square-foot expansion of the Marysville Auto Plant, along with the addition of 50 new full-time jobs to handle the special processes specific to the production of this advanced hybrid model. "With more than 30 years of experience producing the Accord in Marysville, our associates have continued to advance our capabilities, and the new 50-mpg rated Accord Hybrid is a very special milestone in our history of innovation in Ohio," said Rob May, Plant Manager of the Marysville Auto Plant. "Production of this class-leading hybrid represents an important achievement by our associates as they create new value for Honda customers using advanced manufacturing skills and new, cutting-edge technologies." Including the expansion at the Marysville Auto Plant, in the past three years Honda has invested nearly $2.7 billion in innovations to and expansion of its North American operations, with more than $1 billion spent in Ohio alone.